Huahaiyuan History: In 1987,Mrs Wang father lead 5 villiage personals begin to weave the wiremesh.At that time,old machine mostly is supported by pepole, speed is veryslow. 2. In 1995,Mrs Wang older brother began to use advanced machine RGK with hisfather,auto control warp wire feeding, high effciency.Working for the crimpedmesh. In 1998,Mr Wang guaduated from college.Mr wang break weaving machinetraditional,bought welding machine,began to welding mesh. 6. In 2008,Three brother rigist Anping Huahaiyuan Wire Mesh Co.,LTD toghther.Begin to export to world. We have 20 yearsmanufacture experience for the Vibrating Screen Mesh and Self Cleaning Screen Mesh. We can be according to the clients`requirements to produce the decorativescreen mesh. 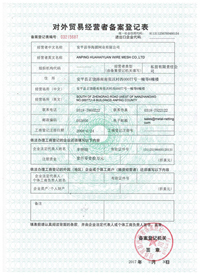 Our products have been though ISO9001: 2000 ceritifcations. Andour factory is checked by the BV and TUV ceritficated. Our products have been exported toEurope, the U.S.A., the Middle East, Southeast Asia, Africa and some otherparts in the world. While we pay much attention to continued effort in betterquality products, We has been passed by the standard of ISO9001:2000 QualityManagement System Certification. We try toprovide products with more variety, good quality, reasonable price, timelydelivery and reliable after sales services. It is our rule to meet customers'requirements and to satisfy our customers. We hope to build up friendly traderelationship with customers worldwide. Welcome to visit our factory!